At the end of last year, the news finally arrived that many Georgia businesses and politicians – especially those in Southeast Georgia – have been waiting two decades to hear: The Savannah Harbor Expansion Project was approved. The project will deepen the Savannah River and harbor by five feet to expand the Port of Savannah’s capacity to accommodate ever-larger container ships arriving from Asia via the expanded Panama Canal. This is the most critical infrastructure development project in Georgia in decades, with Gov. Nathan Deal calling the project “vitally important for economic development and job creation not only in the Southeast, but nationally as well.” Forty-one miles of the Savannah River will be dredged from the Garden City Terminal into the Atlantic Ocean to deepen the river from 42 to 47 feet. Though the total cost of the project is pegged at $706 million, it’s estimated that each dollar spent will result in $5.50 in economic benefits, or $174 million each year. “This is an almost unheard of cost-to-benefit ratio for a project of this magnitude,” says Georgia Ports Authority (GPA) Executive Director Curtis Foltz. The long-awaited Savannah River deepening project aside, 2014 was a very good year for the Georgia ports in Savannah and Brunswick. Not only was it a record year in terms of total tonnage and container traffic, but a 2.7-million-square-foot industrial expansion resulted in the creation of nearly 2,000 new jobs. “Our strong performance not only aided the addition of more than 1,900 new port-related jobs, but it also created additional positions throughout the transportation and logistics chain, as well as supported more than 350,000 jobs across the state,” says Foltz. According to the University of Georgia, the ports of Savannah and Brunswick contribute $39 billion a year to the Georgia economy, and 100,000 jobs in Metro Atlanta alone are related to the ports. A little further down the coast, Georgia could have its own Cape Canaveral in just a few years if plans for a commercial spaceport in Camden County come to fruition. According to Camden County Administrator Steve Howard, things are moving forward in the development of a commercial spaceport on 11,000 acres of property along the Southeast Georgia coast. “Our goal is to create a world-class spaceport here,” he says, and it could happen within the next five years. The area is ideal for launching satellites into space due to the parcel’s large size and its closeness to the Atlantic Ocean and the equator, making for an easier and safer launch. Between the facility itself and potential private satellite manufacturers and educational campuses locating nearby, the project could bring an estimated 2,500 jobs to the area. In fact, this spaceport would anchor one end of what is being referred to as an “aerospace corridor” stretching from Jacksonville to Charleston. A little further up the coast in Chatham County, Gulfstream Aerospace is continuing its rapid expansion, building a new 400,000-square-foot state-of-the-art distribution center on 32 acres in the NorthPort Industrial Park in Savannah. Gulfstream is just one of more than 500 aerospace companies located in Georgia, employing 86,000 workers and generating $50 billion in economic impact. Atkins says that Claxton Poultry, which supplies chicken to KFC and Chick-fil-A, is building a new $20-million feed mill and 200 more poultry houses. Each poultry house holds 27,000 chickens and costs $210,000 to build, for a capital investment of more than $40 million. 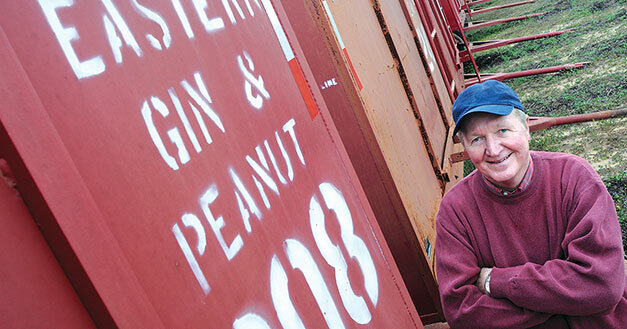 Also, agricultural company Southeastern Gin & Peanut is spending $2 million to build three new warehouses in Appling County, he adds. In Liberty County, Fort Stewart remains the area’s largest employer with more than 4,000 total employees. But right behind it is chemical manufacturer SNF Floquip, which announced plans last year to double the size of its Midway Industrial Park facility to 160,000 square feet and increase total employment by up to 30 percent, according to Liberty County Development Authority CEO Ron Tolley. Tolley is also excited about the Liberty County Manufacturing Collaboration, which was launched by several of the county’s major manufacturers in cooperation with the Liberty College and Career Academy and Savannah Technical College. He says a new internship program will help provide the kind of advanced training needed for the 21st-century manufacturing work-force. “This bodes well for the future of Liberty County,” he says. Ware County is home to the largest wood pellet processing plant in North America, a $160-million facility owned and operated by Georgia Biomass. But according to Waycross-Ware County Development Authority Executive Director Bob Hereford, the biggest economic development news in Ware County last year was the redirection by referendum of SPLOST money that had been earmarked for a spec building to instead be used for purchasing land and industrial park improvements. The county is also working closely with CSX Railroad, one of the area’s largest employers, to help area businesses capitalize on the presence of its switching hub, which is the largest such hub in the eastern U.S. “Not only does this benefit businesses already located here that ship goods by rail, but it can also help us attract new industry to Ware County,” says Hereford. “We see a bright future for economic development in Ware County as we continue to capitalize on our natural resources, land and transportation assets,” he adds. Due to Wayne County’s location in the heart of the “fiber belt,” pulp and pellet manufacturing remain the county’s dominant industry, and pulp manufacturer Rayonier is its largest employer. But the county is working on certifying at least one Georgia Ready for Accelerated Development (GRAD) site this year. In addition, the county is working on landing an international tire recycling company that would create up to 40 new jobs. “This would be one of only two similar type plants in the country,” says Riddle. He adds that Domtar Personal Care, an international company that manufactures adult incontinence products, recently broke ground on an expansion at its Jesup facility that will create 25 new jobs this year.